Last month, I told you about my new prized appliance, the Instant Pot, and shared the twice baked potato casserole I made with it. This month, I am bringing you my second Instant Pot recipe and let me tell you, it gives the first one a run for its money! 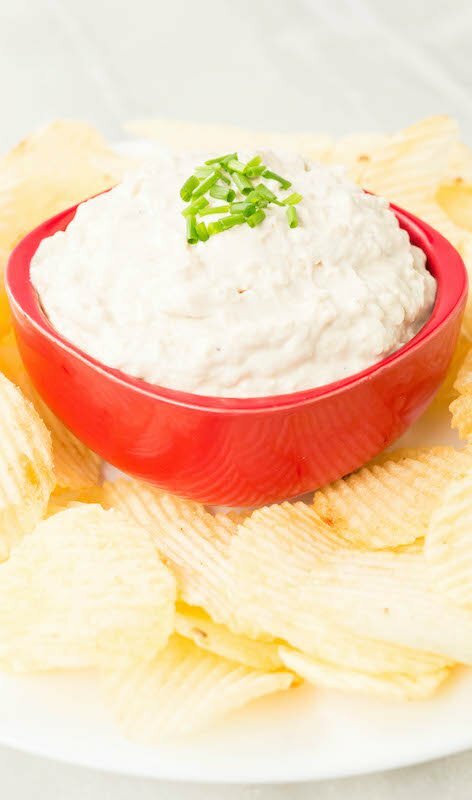 I first started making homemade caramelized onion dip to pack in a picnic we were taking to a concert at the Hollywood Bowl. 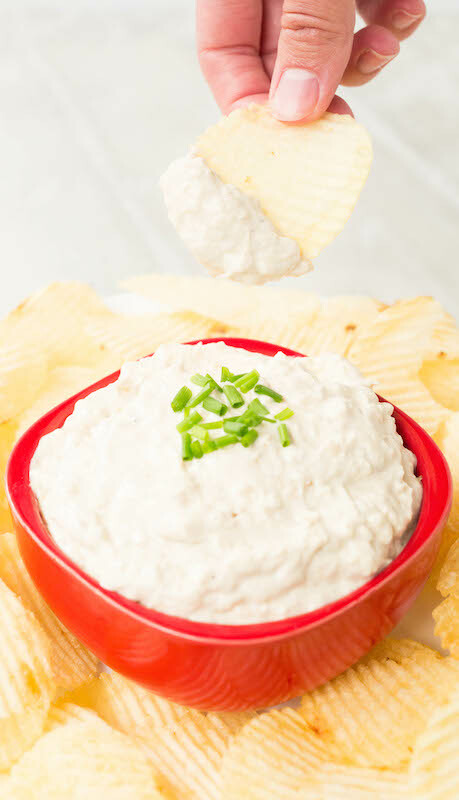 French Onion Dip had always been a comfort of mine, so I knew the homemade version would be good, but I did not know just how good! We were scraping the bottom of the container desperately trying to get every last iota of this amazingly delicious dip! Since the holiday season is upon us, I am in need of easy to make appetizers for all these parties. Unfortunately, caramelizing onions on the stovetop can take an hour or more. Even worse, you have to babysit and stir them the whole time. I found a way less hands-on approach to caramelize onions using the Instant Pot and baking soda. 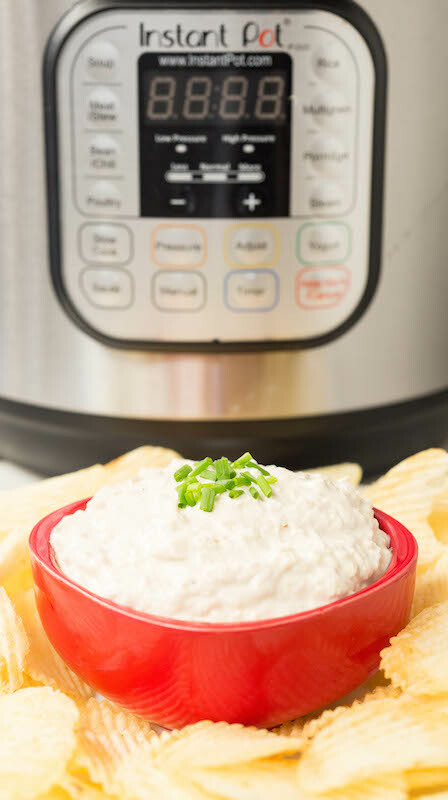 Same delicious dip, much less hassle! If the smell of onion lingers on your lid, check out this post I wrote detailing how you can deodorize your Instant Pot sealing ring. 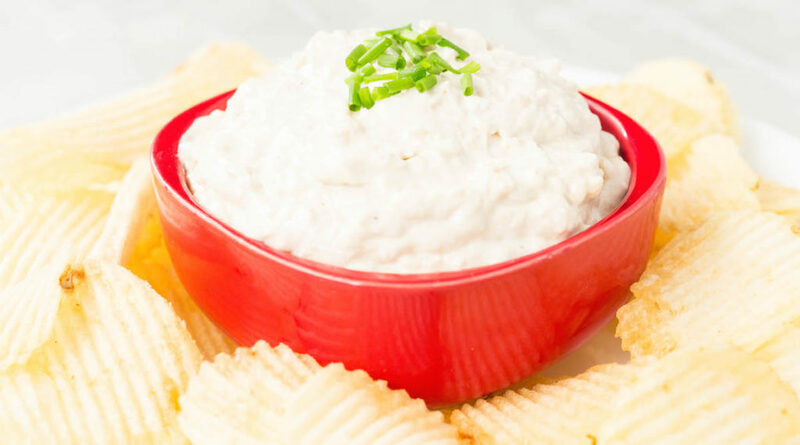 This Caramelized Onion Dip is made hassle-free in the Instant Pot. Makes for a great party appetizer! Melt the butter in your Instant Pot using the sauté function. Add sliced onions, baking soda, salt, and pepper. Stir to combine. Continue cooking and stirring occasionally for another 5 minutes. Put the lid on your Instant Pot, make sure the vent is set to “Sealing”, and cook on high pressure for 16 minutes. When finished, quick release the pressure. Remove lid and press the sauté button again. Stir constantly for 5 – 10 minutes until most of the liquid has evaporated. The onions will probably not be large discernable slices at this point, and the mixture should be dark brown. At this point, I dump mine into a fine mesh sieve to strain the excess butter/liquid that is leftover. You *can* add it to the dip, but if there is a lot leftover your dip is going to be noticeably buttery. Next, add the onions, sour cream, cream cheese, and soy sauce to a bowl. Mix well, then add salt & pepper to taste. Refrigerate at least a few hours before serving. I like to make the day before and refrigerate overnight. This gives all the flavors a chance to meld together.